In Norse mythology, the einherjar (lone-fighters) are warriors who have died in battle and are brought to Valhalla by valkyries. 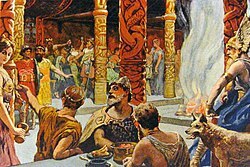 In Valhalla, the einherjar eat meat from the boar called Sæhrímnir. Every day he is boiled and every night he becomes whole again. They drink mead provided by a goat named Heiðrún. Every day they dress for battle and go out and fight each other. This is to prepare for the events of Ragnarök (the end of the world). The einherjar are written about in the Prose Edda by Snorri Sturluson. Also in the poem written in the 13th century Hákonarmál, by Eyvindr skáldaspillir. This page was last changed on 7 December 2015, at 17:09.